The scene last week at Dan's Ace Hardware on West Broadway. It’s been years since Rite Aid Drug closed on West Broadway, but the space finally has a new lease on life. Two leases, in fact. 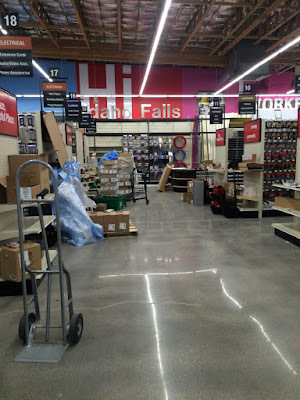 Dan’s Ace Hardware will be opening its 14,000-square-foot store at 1747 West Broadway on Thursday. This is the fifth store Dan Moldenhauer of Rexburg has opened. Others are in Rexburg, St. Anthony, Lava Hot Springs and Garden City, Utah. The store has a sales floor of 11,711 square feet. This doubles the number of family-owned hardware stores on the west side, as Rocknak’s Hardware Plus has been there since 1995. In the other half of the Westfield Plaza building, Marketplace Home Furnishings is eyeing an opening in the middle of March. The store is owned by Dave Collette, D.J. Collette, and Barry and Sue Landon. Although they have extensive experience in property management and business this is the first furniture store for them. “We don’t plan on making it a chain,” Barry Landon said. The store will carry such brands as Elements, Folio 21, Urban Roads and Palliser. Sue Landon is doing most of the buying, and it is she who is calling the shots in terms of display and presentation.